It was late at night. The phone was ringing as if a loud alarm went off. It was someone from the community. Bayram Türk, the imam of the Koca Sinan Mosque in the German capital city of Berlin, hastily awoke from his sleep only to find out that the mosque was burning to ashes. As he arrived at the scene, it was around 3 a.m. in the morning. The firefighters were trying to bring the fire under control. Türk recounts that he was not allowed to be near the area. As he watched his mosque burn away from afar, Türk felt that it was not only a mosque that was set ablaze, it was a center for women, children and the elderly that advocated unity and respect for others. "Our mosques are not only about praying. We teach our children about life, justice, peace and love. It is not our feelings that got hurt. It was everything," the imam said. It was indeed rattling for the entire Turkish community in Germany, which is as large as some 3 million people. 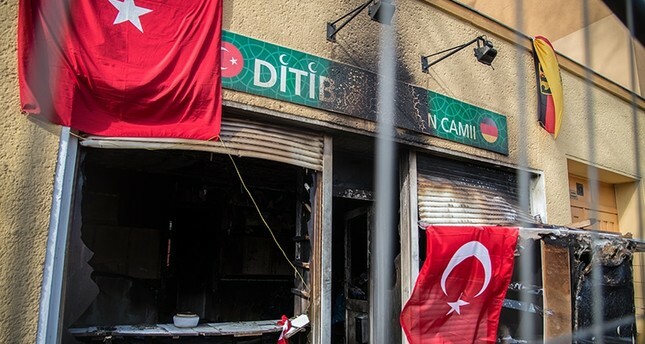 The arson on March 11 against the Koca Sinan Mosque was yet another incident in a series of PKK-linked attacks on Turks in Europe. In fact, it is getting strikingly serious. Aware of the danger they are faced with, the Turkish community gathered last Friday in front of the burned mosque in the Reinickendorf district of Berlin. In a bone-cracking chilly weather, more than a thousand people performed the Friday prayer on the street. "Racism is a moral illness based on ignorance and fanaticism that blinds eyes and hearts," the imam said at the khutbah [sermon] as the German police, spectators and citizens passing by paid attention as well. While attacks by PKK sympathizers and far-right extremists are increasingly taking place across the country, newly-appointed Interior Minister Horst Seehofer's claim that "Islam does not belong to Germany" has been a message that was loud and clear or for both the Turkish community and the attackers. "These attacks on our houses of worship, which are the guarantee of security and peace, and in which different people of various nations, regardless of their opinions and views, peacefully perform their services, deeply grieve us and seriously disturb our community," the imam's sermon, or khutbah, underlined. The Turkish community, indeed, has been dragged into fear. It is estimated that there have been at least 42 attacks against Turks so far alone in Germany this year. Moreover, the German intelligence agency reportedly fears that there will be further attacks by the terrorist PKK. "To be perfectly honest, I started to feel insecure after all these incidents. Some of our relatives even started to stand guard in mosques. I still cannot grasp these attacks as a person who was born and raised here and I find myself in shock," 19-year-old Muhammed Ali Şen said. On the other side, Germans feel for threatened and victimized Turks. On a windy Saturday, Bertha Schmidt was taking a walk in the neighborhood. As she stood in front of the mosque, which is now emblazoned with Turkish and German flags as well as flowers and goodwill messages, Schmidt sighs deeply. At that moment, a placard catches her eye. "All Muslims [Turks, Kurds, Arabs, Bosnians etc.] used to pray together in this mosque," it read. Schmidt was touched. "Certainly I understand that they cannot feel safe. That was a sad thing for me. I hope there will be no further ones. This is gloomy. Thank God that there was no one in there," she said. It is as traumatizing for Germans as it is for Turks. Schmidt has been living in the neighborhood for more than 60 years. She is still having a hard time finding a way to understand it. Albert Kramer also lives nearby. Heading to work on a Saturday, Kramer is in his working clothes. Taking a glance at the ruined entrance of the mosque, he said: "This is intolerance of radicalization. There are always idiots here. I cannot accept such attacks in anyway." Mosques are set ablaze, institutions are targeted, people receive death threats and a wave of fear is quickly spreading across Germany. Yet, a vital question among German-Turks remains unanswered. Does the German politics react against such attacks on mosques and the Turkish community to a sufficient extent? Many believe that the German government is far from it. Over the weekend, Central Council of Muslims in Germany (ZMD) Head Aiman Mazyek addressed German President Frank-Walter Steinmeier and Chancellor Angela Merkel. "The burning of our mosques means the burning of our country," he said. However, the country is now locked in a heated debate about whether Islam belongs in Germany. A remarkable number of people in front of the mosque said Friday that German politics would have reacted harshly and much more swiftly had a Jewish or Christian worship place been attacked. Indeed, the burning of a Jewish flag in Berlin last December stirred the country as all German politicians denounced the incident. The indifference of German politics and security bodies toward the PKK is also questioned. The terrorist groups already previously announced that it would kick off a wave of attacks on Turks due to the ongoing Operation Olive Branch in Syria's Afrin against the PKK's Syrian branch, the People's Protection Units (YPG). Ahmad Saab, an Arab, is of the opinion that the state is turning a blind eye to the PKK. "The state does not even go against them because the PKK took responsibility for the attacks. This has something to do with politics. You can be frustrated but you do not have to burn the houses of God in the middle of the heart of Europe." Amid fears that German politics is remaining remains, Turkey's ruling Justice and Development Party's (AK Party) Istanbul Deputy Mustafa Yeneroğlu, who was present at the Friday prayer, said the Turkish community sent a bold statement, expressing their "silent scream." The AK Party deputy said Germany can be as peaceful and comfortable as Muslims in the country are. He also called on the German authorities to show the same tough reaction to attacks on Muslims.